In some cases, you may need to verify that the respondents are UI faculty, staff or students when taking a survey - examples of this would be when you are using Qualtrics to conduct voting (staff council, student government, etc), or when using Qualtrics to conduct a quiz in the classroom. Note: If you would like to capture identifying information about your respondents in your HawkID authenticated survey (such as HawkID, name, or email address), please see article 100526. 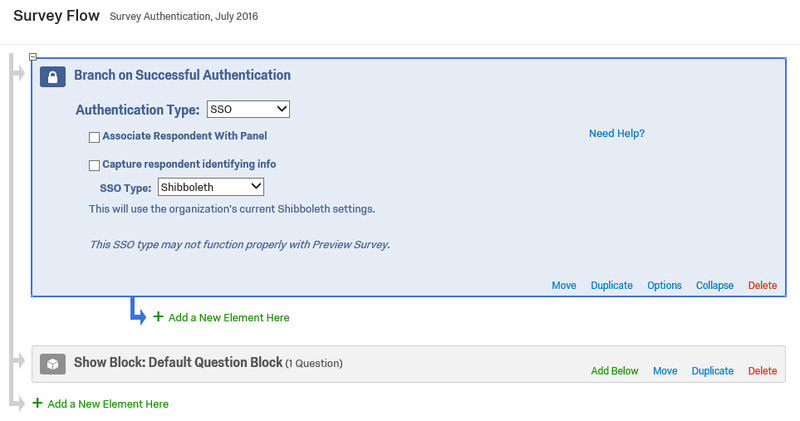 Note: Remove the checkmark next to "Associate Respondent With Panel"
Click Move (under the blue authentication box), and drag the blue box up to the top of the survey flow (this should be the first item in your survey flow if you wish to have respondents authenticate first in order to access the survey). Click the Save Flow button at the bottom of the screen.